It is something that I have always wondered about, the mysterious world of Cannes Film Festival! Ro and I didn't travel around to Cannes last summer while we were in Cote D'Azur, we turn right around when we discovered St. Tropaz was undesirable and stinky. However, town and beach wise I wish we had. The sea and town are very beautiful, however the main strip, which during the Film Festival is basically a car park, could really do with some coffee shops, really really do with easily accessible coffee shops. I was there for 6 days and walking around seeing people like Juliette Lewis, Slyvester Stallone, Sean Penn, Charlize Theron, John C. Reilly (I missed him, however my colleague saw him) and Paul Dando was surreal, it didn't make up for the lack of sleep or chaos that the Film Festival is! We were working with a well known European Luxury Jewellery brand, who were wonderful and extremely helpful, however the jewellery withdrawal process, due to security requirements did make the entire week constantly delayed madness. All brands present at the festival are selling to clients, as well as lending to famous faces, which adds even more logistical hell to the brands! I was working 19 hour days, the one time I did swim for 20 minutes, I came back to 4 missed calls, 8 text messages, 20 emails and 2 whatsapp messages - 20 minutes one morning, not even at the height of the chaos! My colleague was sweet and tried to help but she was tired most days due to driving so much and had failed to keep on reading her emails thoroughly, therefore was constantly out of the loop; add to this a manager who kept on trying to change the itinerary for the day, due to being based separately to the rest of us, resulting in his being out of the loop, means that Cannes is just a crazed nightmare of hell! Add two agents who did their own thing and therefore their models were doing as the agents pleased, means that my life was hell and I had approximately 4 nervous breakdowns! NOW, I am a cool headed, chilled person most of the time, you can pile workload upon workload on to me and I will just trudge on working, however when you are trying to manage a model's expectations and keep her happy and receiving endless calls from agents screaming at you, it is hard to not throw your phone out of the window and crack open the champagne. I did not do this. When you finally get to the event and you are not allowed in, as someone forgot to add your name to the list, so you can not update the model you are escorting and make sure that they are ok, it is even more frustrating. BUT, when this is basically the norm for 6 days in a row, time after time...4 nervous breakdowns seem appropriate. This is just a snap shot but safe to say, I shall not be going back any time soon. I have been horrific and told numerous people that the German's need to go in and sort it out, I find it madness that Cannes Film Festival is organised constantly for six months plus and some random individual is allowed to stand on the end of THE red carpet and no one questioned me for 20 minutes, this is a huge security flaw. The fact that as long as your car has a pass, you can gain access to some of the richest, most talented and famous faces in the world is utter madness, however it is indeed the case! A scary case, but THE case! There are people everywhere and the average person is purely there to star spot and soak in the crazed atmosphere. Everyone else is a manic individual trying desperately to do their jobs. Restaurants have queues every night, hotel bars are rammed with individuals and the paparazzi are lurking around like the dogs which they are! 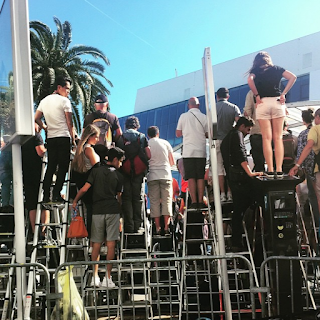 If you like to constantly feel as though you can not do anything, that your hands are constantly tied behind your back, but you would love to stand on the end of a red carpet for little to no reason - Cannes is definitely your place to be! View of the average person!